District attorney: Campus counselor Margaret Roth believed comments Holmes made about killing people were theoretical. Prosecutor: Holmes told therapist his thoughts were "mind rapists." Prosecutor giving background on "the guy in the corner" then switching to briefly mentioning the victims backgrounds to keep them in mind. I think the Prosecutor is building a strong argument so far to show that "the guy in the corner" is legally sane. Prosecutor: Holmes told Margaret Roth people are his problem the only solution would be to kill everybody. Refused sedatives. Ch 7, could you please note on screen who is talking? Is this on any TV channels? Prosecutor: After academic failures and breakup, Holmes sought help from campus mental health program. Prosecutor talks briefly about victim A.J. Boik - shows photo of Boik and girlfriend just before the movie. Prosecutor describes Holmes' academic failures and how his girlfriend "didn't see a future with him" then left him. Prosecutor unveils model of theater. Why is pic out of focus? Prosecutor: The notebook James Holmes sent to a psychiatrist a day before the shooting has "detailed account of how to attack that theater." Prosecutor: Holmes had "obsession to kill" since he was a child and went though family therapy to address it. James Holmes swivelling back and forth in his chair as prosecutor delivers opening statement. Someone in court cries audibly after seeing video of Holmes being questioned. Prosecutor says Holmes talked about increasing self worth by killing others - reportedly told one psychiatrist "children are worth more than other people because they have their whole life to live." Prosecutor says shooter had notebook that was meant for his dad, mom and sister, promises jury they will see hand-written notes. 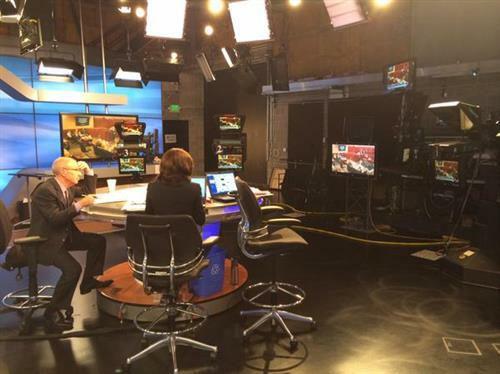 @jmiller, James Holmes is sitting on the far left. In the light blue shirt, wearing glasses. He is dressed in plain clothes but is shackled. Prosecutor George Brauchler: James Holmes was listening to "techno" music through headphones during the shooting. @ValM46, the courtroom camera is fixed shot. Unfortunately, we don't have control of the focus or camera angle. Prosecutor George Brauchler: James Holmes had tire puncturing devices in his car, presumably to help him get away. BREAKING: Prosecutor say both forensic psychiatrists picked by state mental hospital say he was sane on July 20, 2012. Prosecutor George Brauchler: 2 forensic psychiatrists were picked by state mental hospital in Pueblo, and both say he was sane on night on July 20, 2012. Prosecutor George Brauchler talks about shooting victims Rebecca Wingo and Micayla Medek. Says it would take more than an hour to spend just one minute talking about each victim. Prosecutor George Brauchler: "He tried to murder a theater full of people because he thought it would make him feel better." 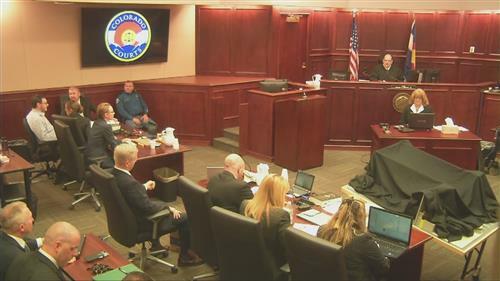 Prosecutor George Brauchler: "One guy who felt as if he'd lost his career, lost his love life, lost his purpose, came to execute a plan..."
There is a large item covered with a black cloth in the center of the courtroom.